The University of North Carolina’s Board of Governors pushed out the head of the state’s university system on Friday, sparking a search for a new leader of the 17-campus system. Tom Ross, who had served as president since 2011, will remain in the president’s role until January 2016, while a national search is underway for his successor. Precise reasons for his announced departure weren’t articulated Friday, other than statements from UNC Board of Governors Chair John Fennebresque about the board’s general desire for a transition to a new leader. The UNC Board of Governors met for close to two hours in closed session before announcing the changes. “The board felt like at the appropriate time there should be a transition to a new president,” Fennebresque said, in comments to reporters. Fennebresque also disputed media reports that Ross’ age was a factor. 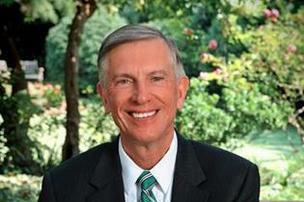 Ross is 64, and prior UNC system presidents had left their positions at 65. Ross said he was interested in working past that, and had hoped to continue in the job leading the public university system. “I love it and I would love to be here forever,” Ross said. Ross’ new terms of employment with the university system includes a salary of $600,000 for the next year, a tenured position at the UNC-Chapel Hill’s School of Government and $300,000 for a year to conduct research following his expected 2016 departure from the president’s office. Conversations about Ross’ termination only began this week, Ross said, and he wasn’t made aware of any single event or issue that turned the Board of Governors against him. Fennebresque went to lengths at a press conference with reporters to emphasize that Ross had been a strong leader that had the support of the board of governors, despite Friday’s announcement that the board wanted to part ways. Ross’ departure was announced Friday after months of speculation about his future after his relationship with the UNC Board of Governors became more fraught. Ross’ 2011 arrival in the president’s office came at the behest of a board of governors that received appointments from Democratic leaders. But since the 2011 shift to Republican control in the state legislature and Gov. Pat McCrory’s subsequent 2012 election , the board’s political makeup has shifted. The UNC Board of Governors is in the midst of a review of university centers and institutes, where questions about whether centers were providing a “diversity of opinion” came up. The current board of directors has also wrestled with its own differences of opinion in its ranks. Harry Smith Jr., one of the governors, made reference to that when he gave an opening prayer at the start of Friday’s meeting. “I ask for tolerance of differing views on this board,” Smith said. Fennebresque said in comments to reporters that he hadn’t been pressured by state legislative or other political leaders, though conceded that he couldn’t speak for the 31 other members of the board. Art Pope, the Raleigh businessman, former state budget director and prominent Republican fundraiser, sent an email to a reporter stating that he had no interest in taking over Ross’ position. Pope had been rumored to be angling for the job. N.C. Attorney General Roy Cooper, a Democrat who has already announced his intentions to run for governor in 2016, issued a statement critical of the board’s decision. The reason….we need to purge as many progressives as possible from these positions. You dont come from the presidency of the Z Reynolds foundation without having some radical leftist ideas. Once again no original thoughts from lsd… Those civitas/newt Gingrich name calling strategies are quite entertaining though. Thanks ML. I am here to shine the light of truth. And I did not call any names, I described the world view. No, not everybody….just the three or four of you paranoids and psychotics who are paid by Fitzy and crew to troll here on the pulse. All the typical North Carolinians have firmly repudiated progressivism/communism. We saw that in November. Funny how you just parrot back what I comment…..polly want a cracker? Alan, there is no way I am joining you and Esmay in crazy land. It is all yours.